← Can I fly when I have cancer? Home » Clinical Trial » My drug is a breakthrough! My drug is a breakthrough! Woohoo! My clinical trial drug may get FDA approval soon! It’s about time. The clinical trial in which I participate has been running for over three years. I take Xalkori (crizotinib) for my ROS1-positive non-small cell lung cancer. Early phase clinical trial results announced last year show around 72% of patients experienced measurable shrinkage of their tumors, and another 12% achieved stability. This is remarkable, considering most chemos have a response rate around 20%. The average crizotinib response lasted about 17 months, with half of the patients still responding when the data was collected for the journal article. I personally know at least four people (including me) who responses have lasted over two years (two of them are not on the trial). Today Pfizer announced it had received US FDA “breakthrough” designation for Xalkori treatment of ROS1+ non-small cell lung cancer. 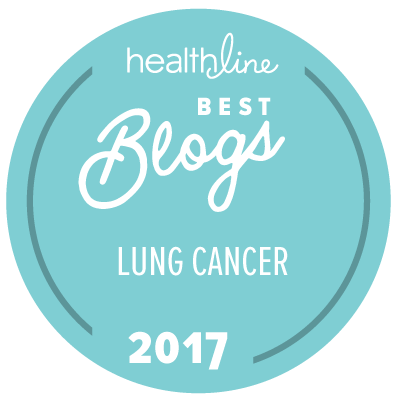 This means it is on the fast track for FDA approval for treatment of ROS1 NSCLC (after already being approved for treatment of a different lung cancer mutation). My marvelous clinical trial drug may finally get FDA approval. It’s sort of moot, in a way, because the evidence of its effectiveness is so outstanding that most US insurance companies are already paying for crizotinib treatment of ROS1 NSCLC. But it is still cool. Coincidentally, I have my clinical trial appointment today, and I’ll be talking with one of the lead investigators (my oncologist, Dr. Ross Camidge) about what this announcement means for those of us still on the trial. This entry was posted in Clinical Trial, Lung Cancer, Precision Medicine, Research, The Bright Side and tagged Crizotinib, ROS1, ROS1 NSCLC, Xalkori. Bookmark the permalink. Hi Janet, I have been following you for some time now, and each time I get your e-mail, I hold my breath. I was so happy to read about your experience with Xalkori and that it is going to be approved for wider use. I have been on Xalkori since July of 2013, after a reoccurence of lung cancer which was now stage 4 inoperable. My first diagnosis was in May of 2000, for which I had a lower left lobectomy followed by chemo (carboplatin/taxotere). I spent every waking moment fearfully awaiting a reoccurence. I live in New York and my husband worked in Wall Street all of his life as a securities trader. Slightly more than a year after my diagnosis we all experienced the events of 9/11. Fortunately we did not suffer any personal losses ourselves, but that day changed my life. I no longer waste any time thinking or worrying about things I cannot change. I lived cancer free until 2013. I enjoyed those years, saw my two daughters get married, gained three grandchildren. We moved from our home to a condo on Long Island and took many trips and made new friends. I considered myself very lucky. I still consider myself fortunate because it turned out that I am positive for the ALK genetic marker. I just had my c/t scan on Thursday with the results – no evidence of adenopathy and otherwise unremarkable. During the ten years I saw my original oncologist he would tell me I am so boring and I would reply that’s just how I want to be – your most boring patient. I related this to my current oncologist and told him from now on I want to be unremarkable. He said I am neither!. Best of luck and good health to you, keep those posts coming.